Save time and money with a renowned Paton Chicken Feeder. A solid galvanised construction, a large 1 tonne capacity, a fully weather proof design and over 50 years of experience in the sector all adds up to Paton having the best Free Range Poultry Feeder on the market. Feeding grain or pellets to chickens in a free range open paddock or open yard configuration can be labour intensive and back breaking work. 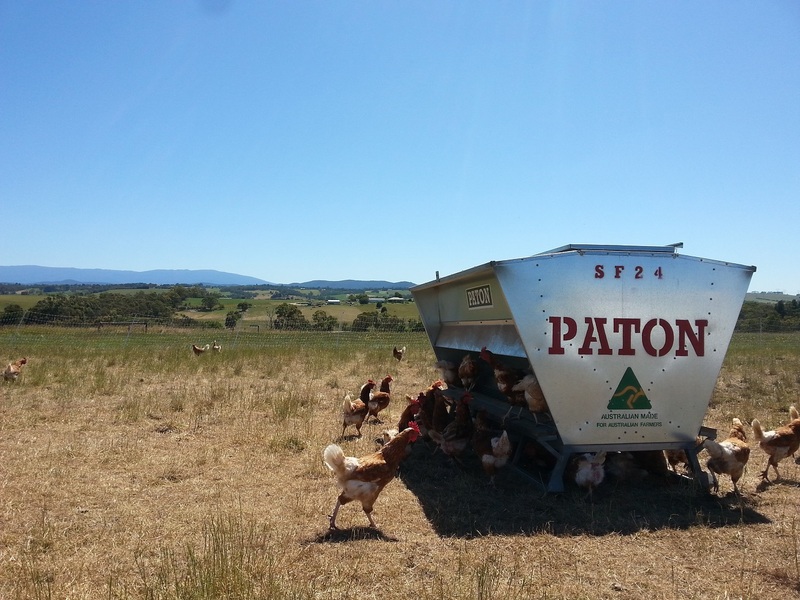 The Paton poultry feeders go a long way to making the job easier and simpler. Bulk feeding Chickens through a dispensing hopper/ feeder means more time spent on other important things around the farm. All poultry feeders have specially designed troughs that reduce feed wastage and create orderly feed access. These specially designed head trays prevent birds flicking grain onto the ground and prevents birds perching inside the feed trough. Perching rails are positioned next to the feed trough and give the birds a stable area to turn and feed. These are made of treated pine and contrast with the slippery trough surface preventing birds from trying to climb into the feed trough.